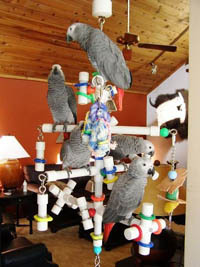 Bird Play Stands | Parrot Play Gyms | Parrot Stands | "Get A Grip"
EXERCISE YOUR BIRD'S BODY & MIND! 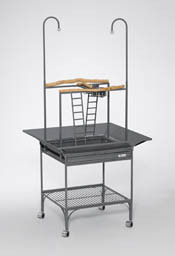 A fantastic manzanita playstand that combines the durability of powder-coated wrought iron with the appeal of natural manzanita that your parrot will love. Description of this product and pricing will be available on the website soon! For immediate details about this unique and versatile envirnoment (part of it will convert to a tabletop unit) please call 760 723-8667. 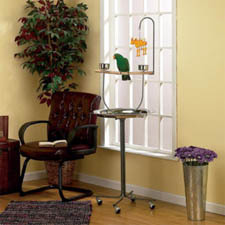 Every Java Wood Playstand is unique and an ideal natural environment for pet birds. Java wood comes from Coffee Trees which grow many horizontal branches making them ideal for parrot playstands. Java wood is beautiful, non-toxic and very durable. Learn more about how a Java Wood Playstand is made. Avian Adventures beautiful Parrot Playstand featuring a removable toy hook, stainless steel tray and natural hardwood perch. Moves easily from room to room on rubber wheeled casters. 24.5" diameter tray, 67" high. 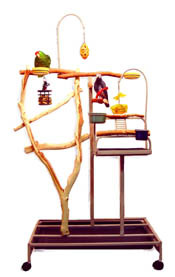 Avian Adventures Recreation Center is a safe and fun place for your bird providing 2 adjustable toy hooks, 2 ladders, 3 perches and 2 food bowls. Available in 5 beautiful colors. Dimensions 24"w x 22"d x 67"h.
Do you have a question? Need it answered quickly? Just click on Live Support. We're here to help! ... what could be more fun? "The Kitchen Sink" ... as the name implies, has it all! A stimulating play area made of indestructible, easily and thoroughly cleanable, high quality material. Everything spins... the perches are the only stationery parts and all the toys are included. Can be hung from your ceiling with an optional extender to prevent birds from climbing too high. 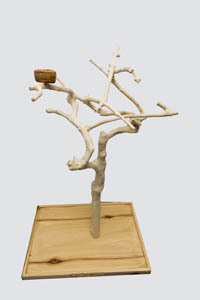 Perches are textured to simulate the feeling and confidence that birds find on natural wood. Available in a variety of sizes and perches. If you like the "Kitchen Sink" be sure to check out the Le Trapeze PlayGyms, too. 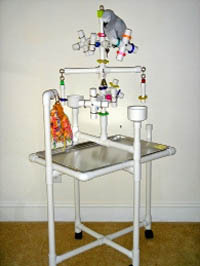 The "Kitchen Sink" Conversion PlayGym is 2 play areas in 1. In less than a minute convert this high-quality play environment from a free-standing gym to a hanging "Kitchen Sink" (see above). This outstanding play environment has interchangeable and scored perches, and comes with all the spinners and toys shown, and more. Available in a variety of sizes including a heavy-duty version for Hyacinth Macaws.